Barrel-aged beers are the great white whales of the beer-nerd world: coveted and often hard to find, they’ll typically come out in small batches, stick to styles like stouts or sours, and generally (not always) pack a pretty big wallop where ABVs are concerned. That makes the launch of any lower-impact barrel-aged concoction noteworthy. The launch of two in one month is even stranger. And that they’re coming from some of the biggest names in the business is, well, just kind of insane. High West might not immediately ring a ton of bells outside the craft-distillery set: It’s a whiskey distillery out of Park City, Utah (the state's oldest legal distillery in the post-Prohibition era). 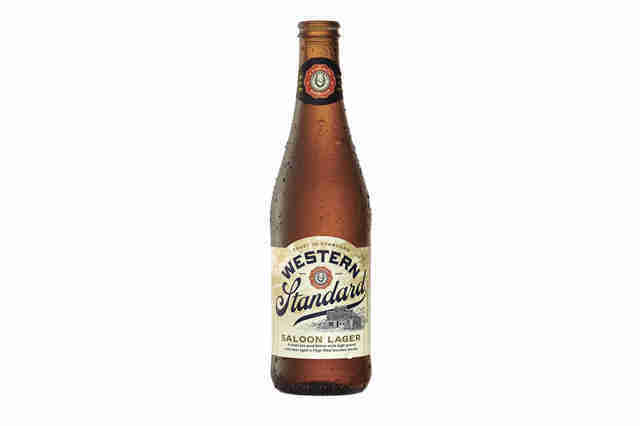 High West's founder recently teamed up with Ballast Point -- the former craft superheroes (now part of Constellation brands) behind the tremendously popular Sculpin series -- for Western Standard. The barrel-aged lager in the old-timey, pre-Prohibition style, one that takes the flavor of a nice crisp lager and kicks it up with oak, vanilla, and tobacco notes due to an extended bath in bourbon barrels. And while Ballast is no stranger to barrel-aging, this marks a strong departure from the (sorry) standard. Even more curious, it clocks in at a scant 5.2% ABV, which is barely a kick compared to barrel-aged juggernauts from the likes of Avery and Founders. It is, in effect, a barrel-aged lawnmower beer. Western Standard is currently only available in Minneapolis, Phoenix, SLC, and Park City, but a national expansion is planned. The pairing of a craft distiller and a still-crafty micro-to-macro graduate is enough to raise eyebrows, but two of the biggest names in Big Booze also swooped in recently with a barrel-aged lager in the same vein: Budweiser and Jim Beam have teamed up for Budweiser Reserve Copper Lager. At 6.2% it’s strong for something associated with the Clydesdales, but still relatively low for a barrel-aged offering. Even more surprising, the beer nerds seem to approve: It’s hovering right around 4/5 on BeerAdvocate (we have yet to taste it). It will be available for a limited time. 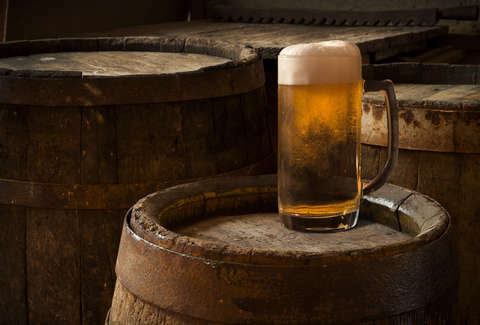 Now, aging lager in whiskey barrels isn't exactly a new practice. It's a very olden-times thing, the sort of practice you'd see in a pre-Revolutionary public house, an Old West saloon, or during some late-night debauchery in Middle Earth. But its resurgence -- and, of course, the breweries bringing it back -- is nonetheless surprising. It’s hard to suss out what exactly this means for the beer world at large, but there are implications at work here: First, the ABV arms race continues to wane, with session beers becoming immensely popular as casual drinkers up their quality game. Stronger beers are still hugely popular, but light beer drinkers are increasingly looking for options that bring big flavor without laying them out after a couple rounds (see also, All Day IPA). It also shows that big beer’s interest in acquiring craft breweries isn't really impeding those breweries' innovation. Ballast doesn't seem to have lost its experimentation and collaborative spirit, but rather has tapped bigger resources and reach more drinkers… many of whom wouldn’t know a barrel-aged beer from a barrel of monkeys. And they're not slowing down, continuing to introduce wider audiences to new twists on classics like they've been doing ever since Sculpin got kicked up with Grapefruit. More barrel aged beers are on the horizon from Ballast, some even more out-there than Western Standard. 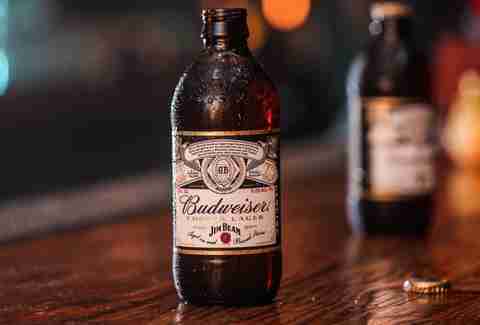 And with Bud, it shows that craft preference seems to be pushing the creative side, allowing the brewers -- who, it should be noted, have access to the best and most technologically advanced brewing technology in the world -- to really let loose. Twenty-five years ago, Bud’s “innovative” beers involved singing penguins and “ice beer.” If they’re aging their lager in barrels now, and people are responding, that means we could be seeing the beginning of a lot more experimentation as brands learn more and more from the craft movement they both seek to overshadow and associated with. You can now get a barrel-aged six pack branded with two of the biggest logos in booze in supermarkets, big-box stores, and bodegas across the nation. Whether this is a flash in the pan, a sign that Americans are now demanding better beer, or a sign of the apocalypse is yet to be determined. Andy Kryza tends to love most things that come in barrels, including monkeys and the disappointment that comes from those weird root beer candies in grandma's candy jar. Follow him to Donkey Kong's house @apkryza.